I got it in 2001, so it’s just shy of 6 years old. It was used (and abused) daily, and ran as a server, so it was always on. Still, I think 6 years is a short life for a Mac. I’ve got Apple hardware twice that old that still runs fine. Through the years I upgraded the RAM many times, put in new hard drives, added a second video card, added USB cards, upgraded the optical drive… It was a good machine. The details are fuzzy, but Saturday night, Dana was using her account, and thanks to “Fast User Switching” was switching it over to my account when it froze with a kernel panic. I figured it was no big deal, as I get a kernel panic about once or twice a year, so we called it a night, and I rebooted it. 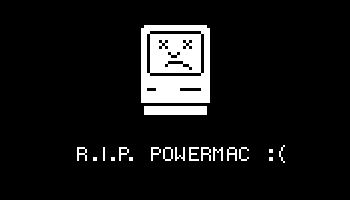 I didn’t realize until Sunday morning at 5:30 AM that the Mac never rebooted properly. I could power it off, and then power it back on, but the monitor would never show anything. Panic? Not yet… I tried many, many reboots. I tried zapping the PRAM, removing some of the RAM, disconnecting the hard drives, starting from a DVD, trying another monitor, trying both video cards, and then I even pulled out the processor upgrade card, and put in the original one. Still no luck. It would chime the startup sound, and I could use the keyboard since the PRAM zap worked, but no dice, just dead. Now was the time to panic slightly. I checked my backup strategy. I had most of the files I needed for clients. They get backed up to an external drive nightly. There was one project missing, which I stupidly had sitting on the desktop instead of in the ‘clients’ folder, but I was pretty sure that was backed up on my iPod as well. (Yay for multiple backup plans!) So my backups were good, but didn’t have everything, just client essentials. At this point, I carefully removed the two hard drives from the Mac, and connected them to my iBook with the connector from one of my external USB hard drives. It’s all good. No data loss. To be honest, I would have been devastated if I had lost all my data. That’s the irreplaceable stuff. The computer? Sure I loved it, but it’s just a computer. It’s not my digital life. So now what? My guess is the logic board is dead, which means the Mac is useless. I’ll run with the iBook as my main machine for now, while I formulate a plan. I have a few, I just need to determine which is best. Posted on Monday, June 4th, 2007 at 10:00 am. Subscribe to the comments feed. Both comments and pings are currently closed. Post on your own blog. The potential data loss is always the worst part, glad you didn’t lose anything. I have a backup script on my laptop (new one since last year) that automatically tries to back everything up once/day. If I’m connected to my drive, great, no problem… so at most, I go 48 hours without a backup. But in the meantime, I use SVN/CVS for various projects so the big loss on my end would be email. Glad to see your moving on to better things and that you were able to move all your data without loss.